Wow, howdy! It's been a while, hasn't it? Between finishing and editing the manuscript that's currently out with my CP's, and the craziness of summer, dividing my time between Tumblr (where I've been posting my "untweetworthy" snippets and other little observations, as well as exploring my current obsession with Supernatural) and Twitter (where I get quite silly sometimes). Summer camp was sort of a bust this year. I lasted three days before The Plague made its way around camp. Of course my daughter was among the victims. And of course I'd spend the second half of the week dying of it, too. 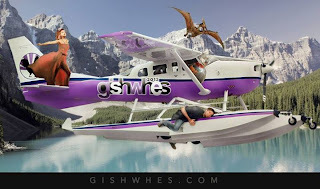 Now that summer is drawing to a close, the next big deal for me is GISHWHES, or The Greatest International Scavenger Hunt the World Has Ever Seen. (at time of writing, you have 9 hours left to register if you want to join in!). What is GISHWHES? Well, go check that link for details. It's a week-long festival of insanity created by Misha Collins to have some fun and do some good. The main goal (other than the fun) is to show people how easy it is to change someone else's life with a small act of kindness. It doesn't need to take a mountain of money or time to do something good for someone. It can be as simple as holding the door for someone who has their arms full. Basically, it's a reminder that what seems like a small thing to you might mean the world to someone else. KINDNESS RULES. Check out the charity, Random Acts, for more info there. This year, I'm proud to be on Team AngrySandwich. From August 11-17, I might pop in here, twitter, tumblr, or even into your crawlspace. Wait, scratch that last one. I haven't mastered teleportation yet. Drat. Where was I? OH! Right. I might ask for a few favors. DO NOT BE ALARMED. THESE FAVORS WILL BE EASY TO PERFORM! AND THEY MIGHT CAUSE YOUR HEART TO GROW A FEW SIZES TOO! Well, metaphorical heart growth. No physical hearts will be harmed in the making of this GISHWHES. I hope. So the next update you see from me might be a strange request, or an odd picture, or a little slice of the crazy. Please to be enjoying.